Approximately 100 people attended our 1st Annual BBQ for residents who live in the Bridgeview neighbourhood in the west-end. Windsor Police, Windsor Fire & Rescue, University Campus Police, Crime Stoppers, MADD Canada and Windsor/Essex Children's Safety Village (Neighbourhood Watch) were all present. There have been a rash of break-ins recently on the 1100 block of Partington. Please secure your homes and be on the lookout, especially if you live in that area. Police were notified and evidence was gathered. I received a few emails from several residents notifying me that there have been several break-ins on the 100 and 200 block of Campbell. They are in the process of forming an official Neighbourhood Watch as a consequence of such recent activities. Let us show are utmost support and provide any help where necessary in assisting their endeavours and making their street more safer. I want to first wish you all a happy Labour Day. I hope your weekend was enjoyable and relaxing. I spent mine canoeing and portaging through Algonquin Park -- one of Canada's many great gems. I would like to bring your attention to a BBQ that is being hosted by the Bridgeview Neighbourhood Watch team. 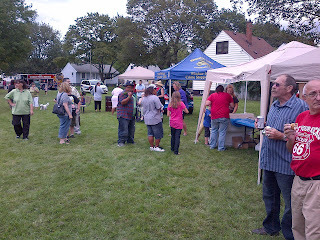 It will be held at North Merritt Park on Sunday, September 9, 2012 from 1pm till 3pm. See a fire truck and an antique police car. Get some home safety tips and get to know your neighbours. Open to all neighbourhood residents. I will definitely be there and I look forward to seeing you there too.